Metro Stem Caster Carts are a simple, effective solution to transform static storage into mobile shelving or standard duty carts. 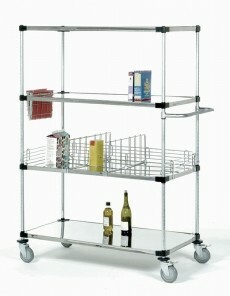 Furthermore, mobile shelving enables an operator to easily re position shelving to clean floors and walls. Therefore you can reconfigure their storage area as needs change. Finally, when used as a true “cart”, a stem caster cart provides strong, reliable transport within a facility and across most floors. • Additionally. swivel stem casters enable greater maneuverability in tight spaces. Brake swivel stem casters are used to ensure a mobile unit remains in a fixed position when needed. Rigid casters are used on a cart to improve the maneuverability over longer distances. • Stem casters are available for basic dry environments, wet environments, and the most aggressive cart wash / autoclave requirements. • 600 – 900lbs. (272 – 363kg) total unit capacity evenly distributed depending on the casters selected. • Metro stem casters are non marking. • 3-1/2” (89mm) flexible , polymer bumpers are included with stem casters to protect walls from damage. When choosing casters consider the load requirement, environment where it will be used, type of floor, and the method of cleaning. Note: Bumpers are included with each caster. When choosing casters consider the load requirement, environment where it will be used, type of floor, and the method of cleaning. Note: Bumpers are included with each caster.